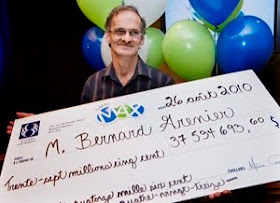 Quebec resident, Bernard Grenier, a truck driver won more than 36 million dollars from a local store. He never picked his numbers, but always let the computer choose numbers for him. He told media that his wife was more excited than him when they found out that they had the winning ticket. The store who sold the ticket, received more $300,000 in commission. Mr. Grenier also said that he would always play and never won more than 2 figures. He also said that he would buy tickets from different locations and he is not going to stop play lotto, and will go for the next higher prize.